A musical survivor whose stay in rock was only fleeting and done more out of the momentary convergent needs of a record label in search of more rock content to release as the 1948 recording ban ended and Dixon herself, whose career was sinking fast after a promising beginning in other styles. 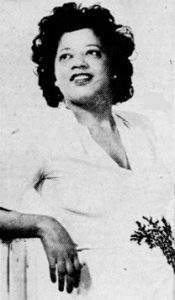 Tina Dixon’s career in music was already a long and often frustrating one by the time she moved briefly into rock ‘n’ roll in 1948. Discovered by swing bandleader Jimmie Lunceford while singing in a Detroit club in 1942, Dixon became one of his featured vocalists in live shows for the next three years, her signature number being the soon to be immortal “E-Bob-O-Le-Bob” (in all of its various spellings and incarnations). Though the song’s authorship has never been definitively sorted out, Dixon was singing it on stage as early as 1942, making her claims of writing it hold more weight than many who recorded it later and saw their own names attached as songwriter. Dixon herself recorded it with The Flannoy Trio in 1945, not Lunceford’s band, with whom she never cut a record for commercial purposes, further diminishing her marketability going forward since he had perhaps the finest swing band in the country. Yet in spite of her lack of recordings Dixon was still something of a star in the black community during these years and her marriage to tap dancer Leon Collins made the couple show-biz royalty for awhile, as Collins was one of the most gifted showman of his era and the two subsequently performed together after her departure from Lunceford’s revue. But with the swing era ending Dixon needed a new field to try and keep her name in the spotlight and when King Records came calling in 1948 hoping for lightning to strike in a similar way as it had done for them with Wynonie Harris and Ivory Joe Hunter, two established artists who pre-dated rock but found it to be an easy and natural transition to the new genre and were already scoring hits, Dixon threw her hat into the ring as well. It should’ve been an ideal match as her rougher voice, jumping delivery and a notable lack of vocal (and moral) restraint when it came to performing were perfectly attuned for the rock attitude. Yet her records failed to shed enough of their pre-rock attributes to fully connect with the ever more savvy and demanding rock audience and without any early returns on her efforts she was cast aside once the recording ban ended and new artists better suited to the emerging style could be signed and brought into the studio. With her release from King as 1949 dawned Dixon’s career was now irrevocably on the downside, taking her back to club work and further out of the mainstream spotlight. Yet her career was far from over, as during these years as strictly a chitlin’ circuit attraction she befriended many of the other scuffling performers from all walks of the entertainment field including comedian Redd Foxx, whose dirty stand up routine would soon bring him a large measure of success with X-rated comedy LPs that were sold under the counter in the late 1950’s. 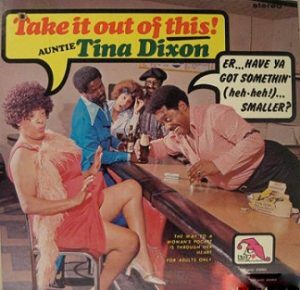 Fifteen years later he’d parlay that reputation to national stardom on the hit television series Sanford & Son, in the process giving his old friend Dixon some guest appearances which coincided with her second career as an off-color singer of note, now billed as Auntie Tina Dixon whose two notoriously dirty LPs on the Laff Records label became cult favorites. A musical survivor, Dixon never achieved fame in any realm but managed to make a living in her chosen profession for much longer than many who had legitimate hit records along the way. While rock ‘n’ roll formed only a small, mostly insignificant, portion of her output, her presence in the field near the dawn of its existence showed how artists had to adapt in one form or another, either to compete against it or conform to it, in order to remain viable as rock’s commercial and cultural impact rapidly grew ever more prominent.